It’s Spring. I was walking in the woods around Loch Lomond recently, taking pictures. New life was bursting out along a stream that meanders beside the footpath. From my first footfall in this wooded area, I had a vague feeling of deja vous. It wasn’t a sense that I’d been here before, rather that I’d been somewhere similar. Not until I was home and checking out the photographs I had uploaded into my computer, did my subconscious produce the answer. It was a different Spring, a different stream, a different path, a different place, a different time, far away and many years ago. In 1988 I was living in Seattle, U.S.A. I’d been taking pottery classes at night school, so when I saw an ad in the paper offering a pottery, ”complete with kiln and some supplies”, for rent, I went for it. In hindsight, it was an irresponsible decision, to say the least. With no knowledge of the state of the business, available accommodation, or the reliability of my landlord, I packed my car and set out for a remote spot in Arizona. The first challenge was actually packing the car. Being seriously financially challenged, I had to pack every last ‘ware’ that I had to sell. Some bits of pottery from night school plus a few paintings,were my only possible source of income for the next while. Having oil painted for years and had modest success in selling my work, albeit at bargain basement prices, all my canvasas were going, completed or not. Then there were the pottery tools and supplies I had acquired, including a sizeable chunk of clay; my coveralls; oil paints; brushes; three easels and a variety of materials required for both media. This ate up valuable space in my little Concord, leaving little room for clothes etc., but no matter who told me otherwise, I was going nowhere without an umbrella and foul weather gear. Having spent my life in Scotland, England and Seattle, (the wettest city in the U.S.) I could not conceive of a place with climate instead of weather. Once packed, I headed my car South down I-5 and my adventure began. In subsequent years, I was to complete the 3,800 mile round trip from Seattle to Northern Arizona several times. Those journeys were always long; always tedious; sometimes eventful; and, while driving the length of California’s freeway system, always hair-raisingly terrifying. Those stories are for another time, though. Suffice to say, on this first trip, having survived the Golden State and crossed the Arizona border, it was plain sailing through the cactus strewn desert along I-10. A few hours later I reached Phoenix and ‘The Valley’, as the Greater Phoenix area is known. Travelling East through Tempe and Mesa, I ran out of road at Apache Junction from where I headed North to Payson then East to ‘The Back of Beyond’, ‘The Boon Docks’, ‘The Sticks’ – whatever name one gives to the uninhabited, endless miles of high desert prevalent in that area. The rest of the trip is a blur. Hot, tired and, at times, despairing, I at last, miraculously, found myself in front of a huge, weathered wood arch that appeared to lead nowhere. In faded paint along the cross bar at the top were the words, ‘Fairy Gates’. I would have thought I was lost once again but for the names ‘Sweenie and Duckworth’ painted on a piece of plank and suspended from the archway with rusty chains. ‘Sweenie’ was the name in the advertisement to which I had replied. I followed a narrow track for several miles until it eventually led into a small, secluded valley where a tree lined stream was a welcome relief from the desert landscape. It crossed my path but was shallow enough for me to drive through. Twenty minutes later, with daylight fading, I got the first glimpse of my new home. The house was made of dark coloured wood, that looked as if it had been treated with creosote, giving the place, in the twilight, a black forbidding look. Set below the road in ten acres, the lot was bordered by woods at the end furthest from the dwelling. An almost deserted trailer park took up most of the adjoining space. 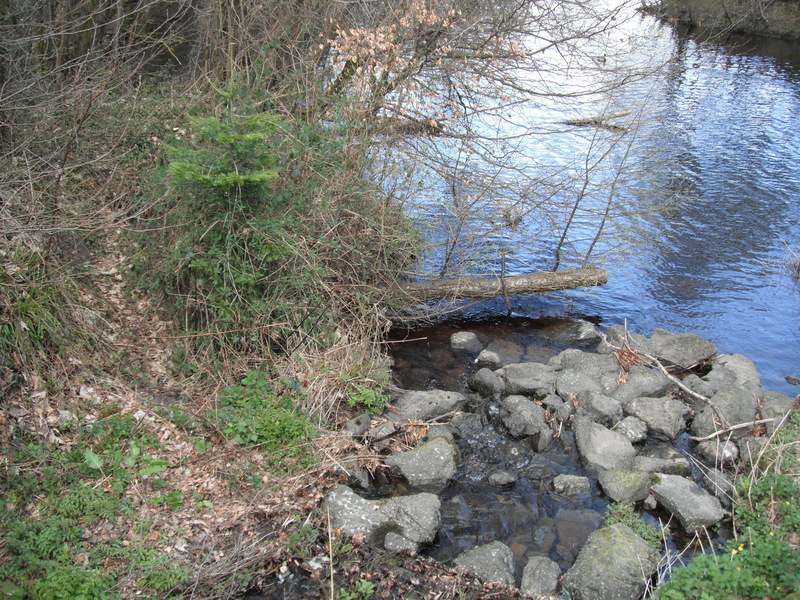 A creek, probably the one I had driven through, skirted the property. This water source explained the vegetable garden that was visible as I reached my destination. Old, stunted, fruit trees looked lifeless, their gnarled branches adding to the general feeling of a place long abandoned. My approach had brought me to the rear of the house. I slammed the car door hard when I got out, hoping to intimate my arrival and elicit a welcome. I hoped in vain. Finding no back door, only a boarded up area where it should have been, I proceeded on foot around the building. At the front, as if to compensate, there were two front doors, one at either end of a railed porch. There was no swing, but a weathered wooden bench and table sat unyieldingly against the wall. Had I not been at the dropping from lack of sleep stage, I might have been alerted to the fact that two entrances at the front and none at the back was a bit unusual. I approached the door to the right and was about to knock when I realised that it was nailed shut and secured with a wooden crossbar. The one on the left appeared to be unobstucted, but heavy enough to deter a battering ram. At this point, were I not miles from anywhere, I would have turned tail. As it was, I went ahead and knocked with no expectation of an answer. This time there was a result. The door slowly opened and I was confronted by a small man with grey shoulder length hair that started halfway accross his scalp leaving the front quite bald. He wore bib overalls with a blue, denim work shirt. ‘You the potter? She’s inside.’ So saying he turned to lead the way. I wondered whether this was Sweenie or Duckworth and who ‘she’ was. A few seconds later I realised that ‘she’ was definitely ‘she who must be obeyed’, a.k.a. Verity Sweenie, co-owner of Fairy Gates. The man was Arthur, her husband.